Standing on the red carpet at the foot of the aircraft bridge waiting for the door to open and your prime minister to come down the stairs is always a tense moment for an ambassador. In your head you run through all the complicated elements of the programme and the substance of the visit and wonder whether you’ve forgotten anything. Will it all go according to plan? But I knew the team at the British Embassy Tokyo had done a great job and that I could rely on our Japanese hosts, so I felt confident as I shook Theresa May’s hand and said, “Prime minister, welcome to Japan”. There were murmurs of appreciation from the crowd on the tarmac when they saw that Mrs May had chosen to dress in the Japanese national colours, red and white. This was widely picked up in the local media. Prime Ministers May and Abe held a bilateral summit in Tokyo. Mrs May has been developing a growing relationship with Japanese Prime Minister Shinzo Abe since having invited him to her country residence, Chequers, in April and again having seen him at the 2017 G20 Hamburg summit in July. Abe was keen to show her something of Japanese culture on her first visit to Japan, so he invited her to start her trip in Kyoto. Mrs May enjoyed experiencing a Japanese tea ceremony at the famous Omotesenke tea house, followed by a private dinner at the State Guest House inside Kyoto’s Imperial Park. There we sampled delicious kaiseki cuisine (a traditional multi-course dinner) against the backdrop of a beautiful carp-filled pond. I think travellers at Kyoto Station that evening must have been surprised to spot two world leaders standing on the platform waiting to board the Tokyo-bound Shinkansen. 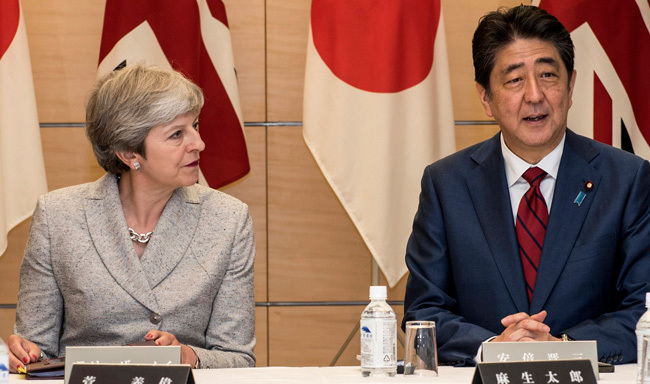 Mrs May had been keen to sample this iconic Japanese experience, and the journey provided a further opportunity for the two prime ministers to really get to know each other. Sitting across the aisle, I was struck by the evident warmth of their personal relationship. It had not been an easy week for Japan, with a North Korean missile fired across Hokkaido. So I think Abe and the Japanese people were glad to have a supportive friend and partner in town. Mrs May made clear that Britain stood shoulder to shoulder with Japan in facing the reckless and unacceptable behaviour of the Democratic People’s Republic of Korea. She pledged to work with Japan at the UN Security Council and elsewhere to bring further pressure on North Korea. Mrs May, who discussed the situation in detail with Abe and senior cabinet colleagues at Japan’s National Security Council (NSC), is only the second foreign leader to have attended a meeting of that council. Prime Ministers May and Abe spoke at the Japan–UK Business Forum on 31 August, along with Secretary of State for International Trade Liam Fox (middle). The growing security collaboration between Britain and Japan was symbolised by the prime minister going aboard the JS Izumo, the Japan Maritime Self-Defense Force’s largest ship, together with Minister of Defense Itsunori Onodera. Things don’t always go entirely to plan, and heavy rain meant that, instead of going by helicopter as intended, we had to start early and travel down to Yokosuka by motorcade. On board, the prime minister was briefed on the regional situation and on growing UK–Japan cooperation. She met Royal Navy divers who had been exercising with their Japanese counterparts on mine clearance. She learnt that Anglo–Japanese naval links go back a long time when the ship’s cook demonstrated his kare raisu, explaining that curry had first entered the Japanese diet via Indian cooks on Royal Navy ships more than 100 years ago. Following the success of the visit by RAF Typhoon jets last year, the prime minister announced that HMS Argyll would visit Japan in 2018, and looked forward to ground troop joint exercises, too. Japanese interlocutors expressed the hope that one of Britain’s new aircraft carriers, currently undergoing sea trials, would visit Japan at some stage. Alongside security, business was a key theme of the visit. Mrs May was accompanied by Secretary of State for International Trade Liam Fox and a business delegation, all of whom attended a large business forum organised by the embassy and the Japan External Trade Organization. At the formal summit meeting, the two leaders agreed that the EU–Japan Economic Partnership Agreement, currently being finalised, could form the basis of a new UK–Japan trade agreement once the UK has left the European Union. High-level trade talks will begin in Tokyo later this month. They also agreed to enhance cooperation on a range of areas, from industrial strategy to space. At a glittering state banquet held in the magnificent Akasaka State Guest House and attended by Japanese cabinet members and captains of Japanese industry, Abe expressed his continuing confidence in the UK as a destination for Japanese investment. Mrs May, in turn, reassured Japanese business that the UK would remain a highly competitive base for their activities. In a nice personal touch, an orchestra played a selection of pieces, ranging from Elgar to Abba, that turned out to be from the prime minister’s selection on the BBC’s Desert Island Discs radio show. Such was the warmth of the evening that, at the end, instead of leaving promptly, Abe escorted the prime minister around all the tables introducing her to Japanese business leaders. Mrs May with Dr Fox and the business delegation. On the third day of her visit, I accompanied Mrs May on her audience with the emperor. The Imperial Palace is an extraordinarily tranquil haven in the midst of a huge, bustling city. His Majesty was very warm and gracious, and I am sure it was a memorable experience for the prime minister. Later, she was hosted by Tokyo Governor Yuriko Koike at a wheelchair basketball match between Team Great Britain and Australia at the Tokyo Metropolitan Gymnasium in Sendagaya. Despite the enthusiastic support of a good crowd, including students from the British School in Tokyo, we lost. As a former high commissioner to Australia, that left me somewhat disappointed. Subsequently, at my residence, Mrs May also met Yoshiro Mori, Olympic and Paralympic Games Tokyo Organising Committee president and former prime minister, as well as Shunichi Suzuki, the minister in charge of the Tokyo 2020 Olympic and Paralympic Games. Our two governments have agreed to support the Tokyo Games by building on the great success of London 2012 and working closely together in areas including counter-terrorism and cyber security. Fittingly, the prime minister’s final event was a large reception, at my residence, attended by a wide variety of guests with links to Britain in the areas of sport, culture and academia. She met actors and musicians; Olympians, Paralympians and football ace Hidetoshi Nakata; as well as eminent academics and young British teachers working on the Japan Exchange and Teaching Programme. It was an excellent reminder of the strength and diversity of our bilateral ties. Seeing the prime minister back onto her RAF jet at Tokyo International Airport Haneda, I reflected on the whirlwind of activities and substantial policy discussions we had undertaken over the three days of her visit. Mrs May was delighted with her first impressions of the country, the warmth of Abe’s welcome and the step forward she had made in taking the UK–Japan relationship to a new level. I can see that life at the embassy is going to get even busier. Attended reception at the British Ambassador’s Residence with guests from the worlds of art, culture, science and sport.